There were more men available to Steve Baker than had been the case on Wednesday night at Grays, and the result was a change of formation. Three centre-backs were deployed, no doubt in response to the likely aerial threat from one of the biggest teams in the league, while further forward Lewis Driver dropped to a forward midfield role in behind Marc Charles-Smith and a fit-again Sahr Kabba. Giddens saved an early Steve Brown header but Harrow fell behind to a fourth minute goal, as yet again they conceded early on, a trait that is becoming a habit, and one that needs addressing urgently. Taafe’s right-wing cross was headed on by Cunnington, and Bricknell volleyed the ball in at the back post. But Harrow hit back with a good spell of pressure. A Kurtis Cumberbatch drive was blocked, Driver and Kabba had shots blocked too and then, in the 16th minute, came a golden chance to equalise. Charles-Smith floated the ball deep from the right, Shaun Preddie brought it down and found George Nicholas, who was caught by Krasniqi as he turned away. Sahr Kabba took the spot-kick, it wasn’t a bad one, but Giddens guessed correctly and dived full-length to his right to turn the ball round the post. The ensuing corner saw Preddie flash a header over at the near post from Cumberbatch’s delivery. Ellul shot straight at Hazlett from a right-wing cross, and the Harrow keeper then saved at Bricknell’s feet after Preddie’s error let him in. Cumberbatch then sent Kabba away with a great through-ball, but Giddens came off his line and spread himself to block. Driver picked up yet another booking in the 37th minute, for a foul in the opposition half, and the resulting free-kick was punted downfield, Swaine nodded the ball on and Bricknell finished acrobatically. Harrow might have had another penalty for Swaine’s holding down Charles-Smith, but referee Mr Robertson-Tant saw nothing wrong. The half ended with Danny Hicks’s header saved comfortably by Giddens, and Preddie making an important block to stop Taafe. Once again Harrow were guilty of starting a half slowly – underlining my earlier point – and Cunnington should have scored in the opening seconds of the second period when he took the ball past Preddie but then fired wide. Josh Webb blocked a Taafe effort and Swaine directed his effort wide at the far post following a long free-kick. Charles-Smith latched onto Nicholas’s fine pass and tucked the ball past the outrushing Giddens, but his strike lacked pace and Swaine got back to clear the ball off the line. Driver then shot across goal, Hazlett denying Swaine’s headed effort at the other end. With an hour gone, Baker made a triple change, sacrificing one centre-back (Hicks) and introducing two wingers. The immediate effect was a negative one, with the hosts stepping up the pressure, especially the aerial bombardment. Hazlett made a fine save from Bricknell’s sharp turn, and then parried Ellul’s towering header, resulting in a scramble before the ball was hacked clear. Seymour then picked up a Joshua Webb clearance and hit a screamer that Hazlett dived to turn away one-handed. With ten minutes to go, Harrow gave themselves a chance of getting something from the game. Charles-Smith broke forward and was crudely hacked down by Swaine. Play was allowed to continue as Kabba picked the ball up and burst into the area. Ellul’s tackle on him seemed to have put the ball out of play for a corner, but the referee pointed to the spot. There was much terrace comment about whether the penalty award had been to save the referee from dismissing Swaine, who had already been booked. However, after a four-minute delay for treatment to Charles-Smith, Joshua Webb scored the spot-kick. The chink of light was rapidly extinguished as Billericay managed the closing stages well, and indeed might have added to their lead, with Bricknell drawing another fine save from Hazlett, and Nicholas clearing off the line from yet another header from one of the hosts’ giant centre-backs, in this case Ellul. The three points gained at Grays last Wednesday seemed even more important on the final whistle here as one or two other results fell badly for Harrow. The week ahead sees away and home fixtures against fourth-place Leiston, the first being Tuesday night’s trip to the Suffolk coast. BILLERICAY TOWN: Jack Giddens, Tambeson Eyong, Oliver Sprague (booked, 43 mins), Abs Seymour, Rob Swaine (booked, 71 mins), Joe Ellul (booked, 55 mins), Lewis Taafe, Matt Johnson, Billy Bricknell, Adam Cunnington, Kreshnic Krasniqi (sub Isaac Layne, 75 mins). Unused subs: Danny Fitzsimons, Will Putt, Ibrahim Diallo, Christian Assombalonga. 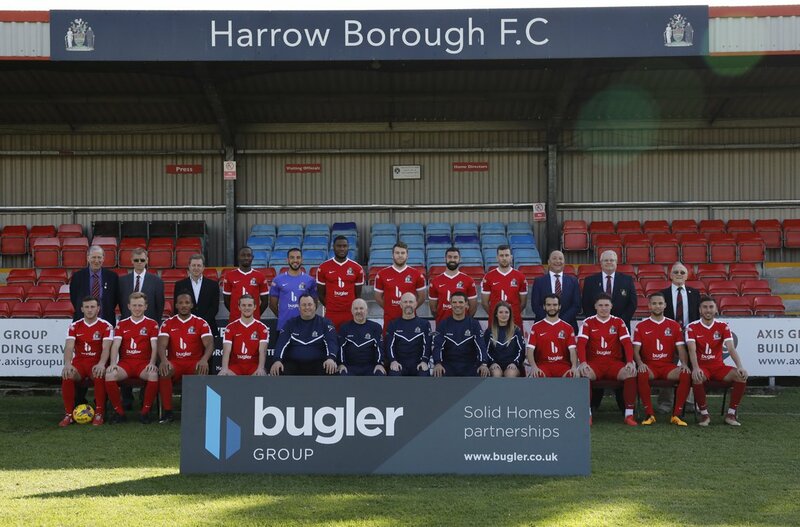 HARROW BOROUGH: Brendan Hazlett, Josh Webb, Andy Lomas, Shaun Preddie, Steve Brown, Danny Hicks (sub Harry Newman, 62 mins), Kurtis Cumberbatch (sub Joshua Webb, 62 mins), George Nicholas, Marc Charles-Smith, Lewis Driver (booked, 37 mins; sub Francis Babalola, 62 mins), Sahr Kabba. Unused subs: Michael Bryan, Lewis Ochoa.